My life does not end at my death. That is the glorious reality of the Christian faith. Adam brought death into this world, and Jesus, the second Adam, absorbed death into himself, offering eternal life to all who find their hope in him. He is my only hope, and I therefore have the promise of life everlasting. Eternal life is truth, and death stands as a small barrier over which we all climb into eternity. Almost all people fear death, the great equalizer of all men, the fight no mere man can win, the great destroyer of hope, health, and happiness, the unspoken motivation for much of our world’s workings, the most certain end to the life which every man shares. Death. Death is the enemy of mankind. But he is an enemy on the long slow walk to his own death at the hands of the life of all men, Christ. If this is true, what then should I fear in this world? I think the only logical answer is that I should fear God. And my fear should be empowering. 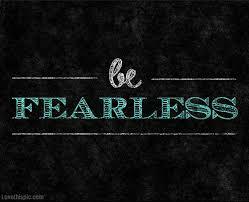 It should empower me to live a life marked by fearlessness of all lesser things than God. Which equals everything. Should I fear failure? No, fear God. Should I fear ridicule? No, fear God. Should I fear disappointing those around me? No, fear God. Putting fear in its rightful place propels me to try something new. I can let go of my fear, and when I let go, I am free to grasp tightly onto God. I am free to try things others deem risky. I am free to follow wherever my shepherd leads. I am free to run as fast as I can into the darkness of uncertainty with confidence in my stride. Christian, Christ has taken your greatest danger and has made it into a door to your greatest good. Run towards that door with abandon. Cover as much ground as you possibly can, and try something great for God. All of Christ. For all of life.